Communications Minister Nomvula Mokonyane has read the riot act to those involved in illegal land grabs or occupations, saying their actions are undermining legitimate land reform efforts. She said land expropriation had become a racialised issue, and the objective of creating a more inclusive economy had become overshadowed by political rhetoric and race baiting. "Land expropriation is not a black and white issue. It is an issue of the economy, and the exclusion of South Africans from the formal economy. "It does not matter if the person affected is a Modise or a Van Der Merwe, land grabs are unacceptable," said Mokonyane. Legitimate land reform is aimed at making the economy more inclusive, she said. Mokonyane's remarks were in the context of Parliament's ongoing land hearings and engagements aimed at establishing whether Section 25 of the Constitution must be amended to allow for expropriation without compensation. The land debate has at times become highly polarised, with land expropriation conflated with land grabs and occupations. Critics have condemned plans for land expropriation, with Afriforum, for example, claiming it is a plot to hand over natural resources to China. Meanwhile Julius Malema, leader of opposition party the Economic Freedom Fighters, has publicly urged South Africans to occupy land by force. President Cyril Ramaphosa has condemned illegal land grabs. Reporters asked Mokonyane about a case late in August in Soshanguve, Pretoria, where the property of a black South African man was occupied. Those occupying the land asked the man to pay them for part of the land after he showed them paperwork proving that it belonged to him. Mokonyane said illegal occupations would not be tolerated by government. "We will never allow and tolerate land grabs in our country. "We have our laws and those who grab land will be dealt with. 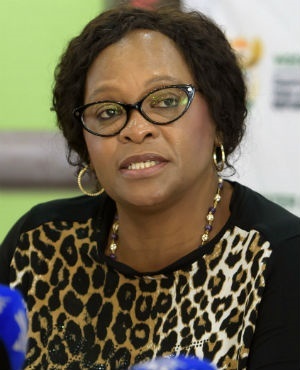 If the law enforcement agencies derelict their duties, it is then necessary for us to ensure that that is addressed and we stamp out any illegal activity," Mokonyane said.